Start by cutting all of the layout pieces ONLY shown in the Jeepers Creepers WYW instruction guide (do NOT cut the darker-shaded card pieces labeled 4, 5, and 6!!). 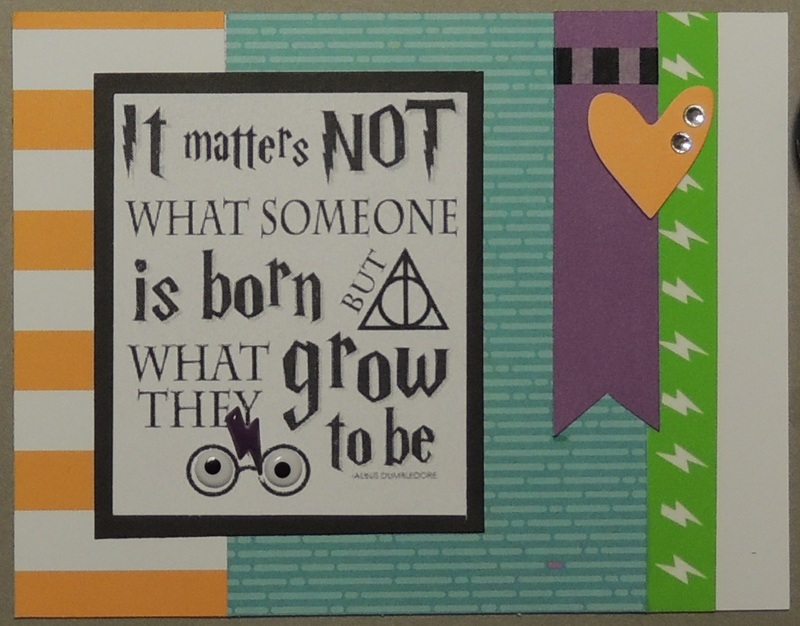 Then, using the scraps that are left over, you should have enough paper to cut pieces to create TWO of each card design shown here. 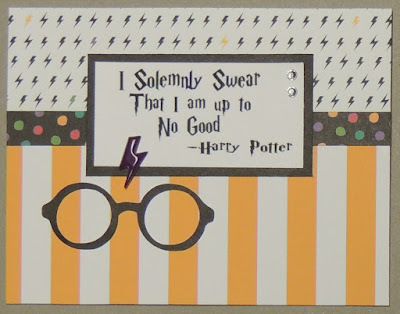 The key is to cut each of the papers one sheet at a time (starting with Card #1 first, then Card #2, and so on). ALWAYS cut the smaller measurement first (that's how I got it to work out). Also, when you're cutting the smaller measurements first, make sure you are paying attention to which way the stripes and zig zags are going! 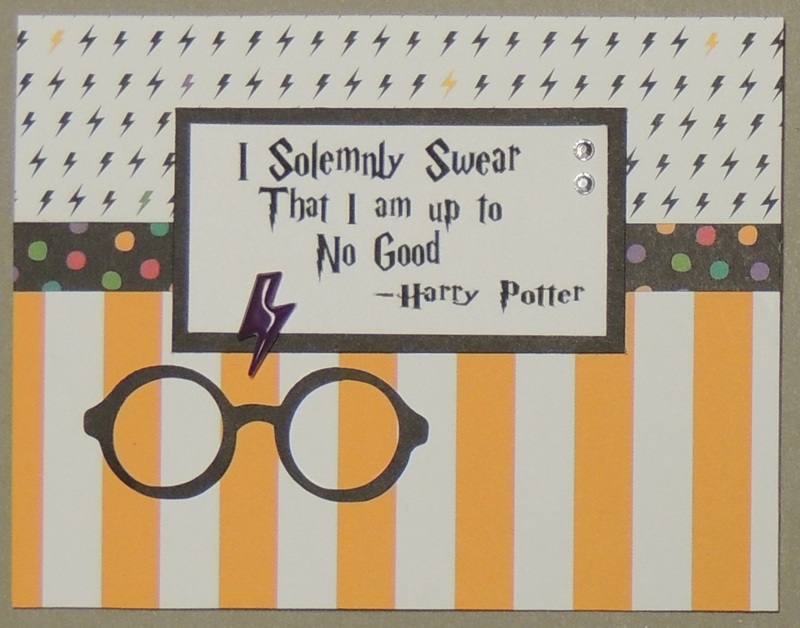 If you keep the stripes pointing the same directions as my card samples show, you should have just enough paper. Make sure you cut the second (duplicate piece for each card) right away from the same strip you cut the first one, before moving on to cutting the next pieces. In addition to 12 standard-size card bases and envelopes (item #X254), you will also need one sheet of Black 12x12 cardstock and some clear Sparkles ((item #Z3274). 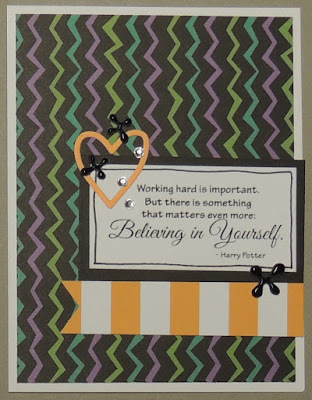 You will also need some very minimal scraps of Black, Lemon, and Tangerine cardstocks to make your Cricut Artistry cuts. 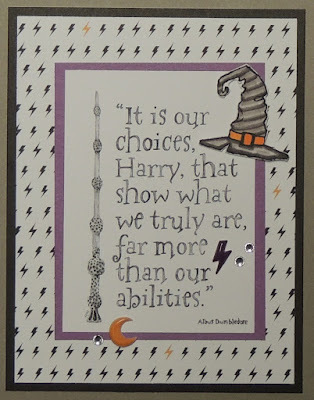 The only stamped and colored-in image is the sorting hat on Card #2, so unlike most of the creations I share on my blog, these cards require very minimal stamping! Leave your email address in the comments below (or email me!) if you want to request that I send you a copy of the full instructions (an MSword document). This file will also include a page that you will print two of (in black and white) on White Daisy cardstock to create your sentiments for each card. Enjoy!! 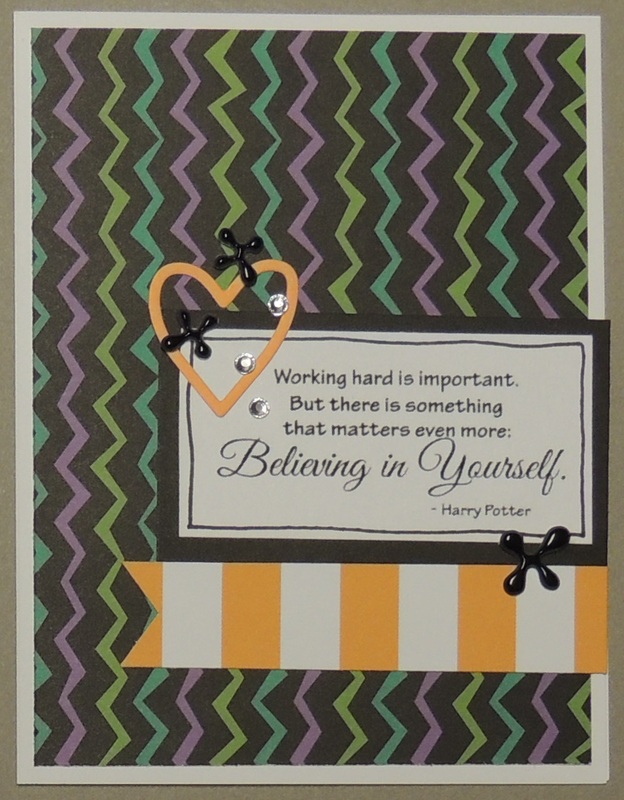 1.5 “ on Canary and Tangerine cardstocks. Mount lightbulb with 3-D foam tape. 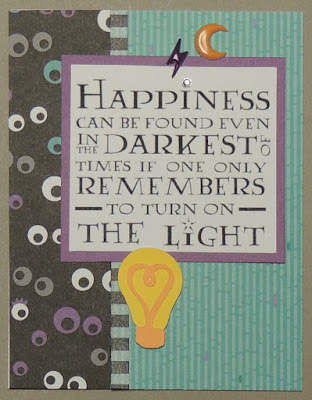 with Black Memento ink on White Daisy CS scrap. Colorless Blender 0 markers, and cut it out. Mount sorting hat with 3-D foam tape. 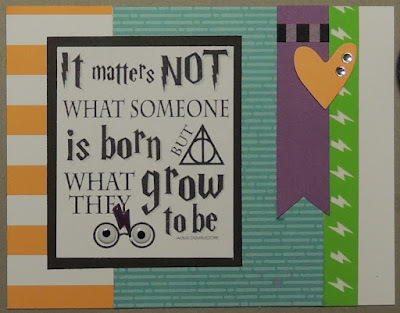 1" on Black cardstock, adhere w/ fine glue pen. Cloud & Moon Zip Strip – 3” cut from left side. Tangerine CS heart cut w/ smallest of Hearts thin cuts. Tangerine CS heart cut w/smallest of Hearts thin cuts. National Stamping Month (Create Kindness) Blog Hop! 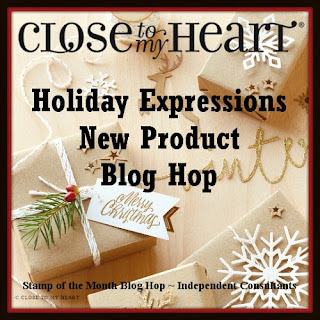 National Stamping Month Blog Hop! 3x3" LOVE card - 2" scalloped circle punched from RASPBERRY cardstock. Colored with Cherry Pink, Tender Pink, and Leaf Green markers. 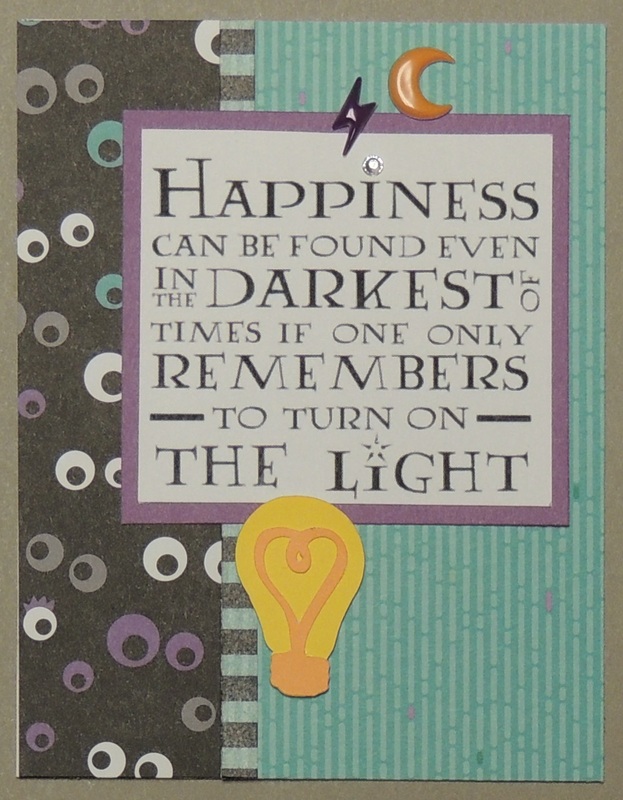 3x3" SMILE card - 2" scalloped circle punched from LAGOON cardstock. Colored with Peacock Green, Turquoise Blue, and Leaf Green makers. 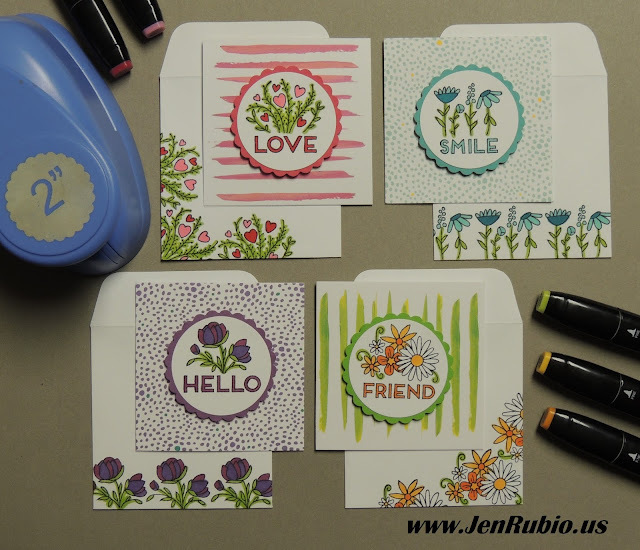 3x3" HELLO card - 2" scalloped circle punched from PANSY cardstock. Colored with Lavender, Peony Purple, and Leaf Green Markers. 3x3" FRIEND card - 2" scalloped circle punched from WILLOW cardstock. Colored with Golden Yellow, Marigold, and Leaf Green Markers. Cut a 3x6" scrap of white daisy cardstock. and coloring your flowers on the outside. through to the inside/backside of your envelope. 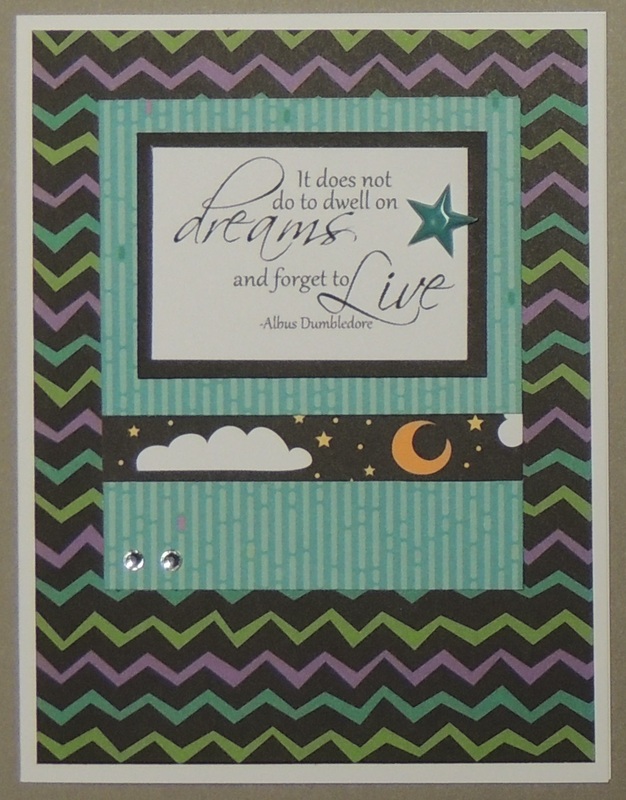 featuring the Rustic Home and Jeepers Creepers papers. 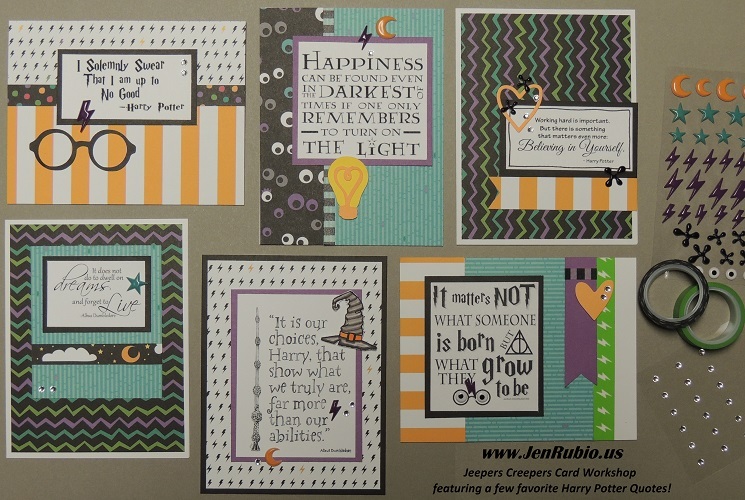 ...click HERE to see them in the new Idea Books online now! Here's my trick for making the bow: First, cut 7" of twine ribbon from the spool (Rustic Home Ribbon Pack). Then cut the ribbon in half down the center, so there are just three strands on each side. This will allow you to create TWO bows from one piece of ribbon and stretch your ribbon even farther. Tie the pieces into bows and attach with a mini glue dot.